The cities in the West are not the safest place to be. In the disc-flicking game Flick 'em Up!, you can become an outlaw and rob banks, free prisoners, attack innocent bystanders... or you could become the Sheriff and try to protect the people of your city from these bandits! Relive the great adventures of the West, face your enemies in street duels, use different guns and tactics to get what you want. You can follow the scenarios or create your own—the choice is yours, cowboy! https://youtu.be/fWHDqBDmIKY ..
Flick 'em Up! 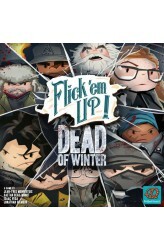 : Dead of Winter pits players against zombies in a dexterity game that has you using tools in various ways to take out the undead while they in turn shamble somewhat randomly in your direction. Based on the best-selling Dead of Winter, form your group of ten survivors and explore the city with ten scenarios. Shh! The slightest sound will wake the zombies! With the new — and terrifying — zombie tower, you'd better be ready and rearing to go when the zombies attack! Will you be able to flick some zombies? https://www.youtube.com/watch?v=hTLmYuoI3b0 .. The infamous Cooper clan has begun taking over small villages. 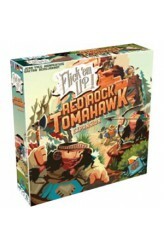 Those villages, however, belong to the Native Americans who are armed with bows and tomahawks and ready to defend their land in five exciting scenarios in Flick 'em Up! : Red Rock Tomahawk. But they best be careful around the Cooper clan's new weapon: the relentless Gatling gun... https://youtu.be/Ny-39_1TsBU ..
What’s a cowboy without his horse, you ask? 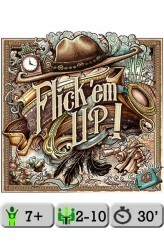 Well, ask no more for Flick 'em Up! 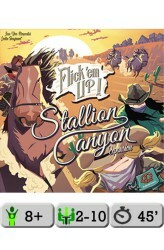 Stallion Canyon, the first expansion for Flick 'em Up!, introduces dashing horses! Two cowgirls also join the gang amongst many new elements that will have you conquering brand new towns and scenarios for more flickin' fun! https://youtu.be/ZaNdheSQUuw .. In Junk Art, players are presented with junk from which they must create art. Thus the name. 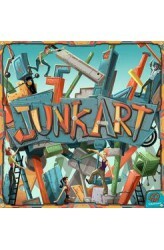 Junk Art contains more than ten game modes, along with more than sixty big colorful wooden components. In one version of the game, players pile all of the wooden parts in the center of the table, then are dealt a number of cards, with each card depicting one of these parts. On a turn, a player presents their left-hand neighbor with two cards from their hand. This neighbor takes one card in hand, then takes the part shown on the other card and places it on their base or on other parts that they've already placed. If something falls, it stays on the table and the player continues to build on whatever still stands. Once players have finished playing cards, whoever has the tallest work..